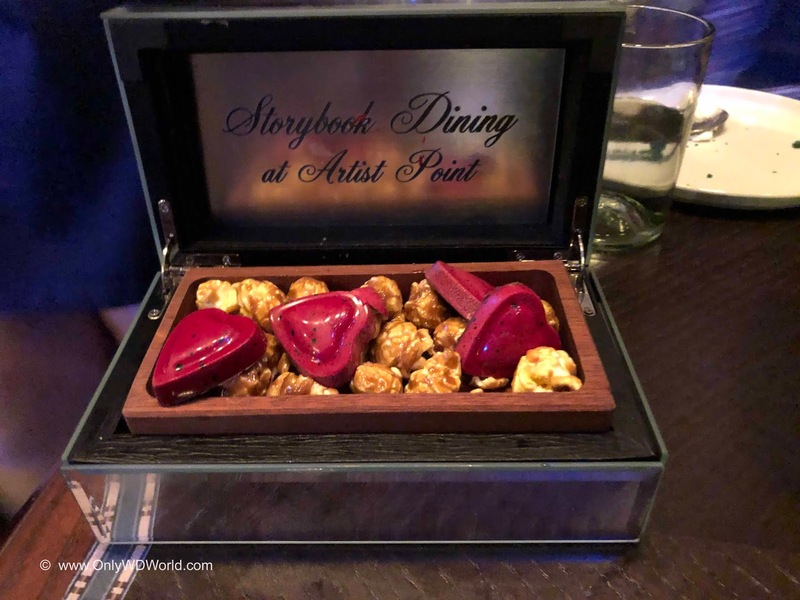 The newest Character Dining Experience at the Walt Disney World Resort is called Storybook Dining at Artist Point with Snow White. 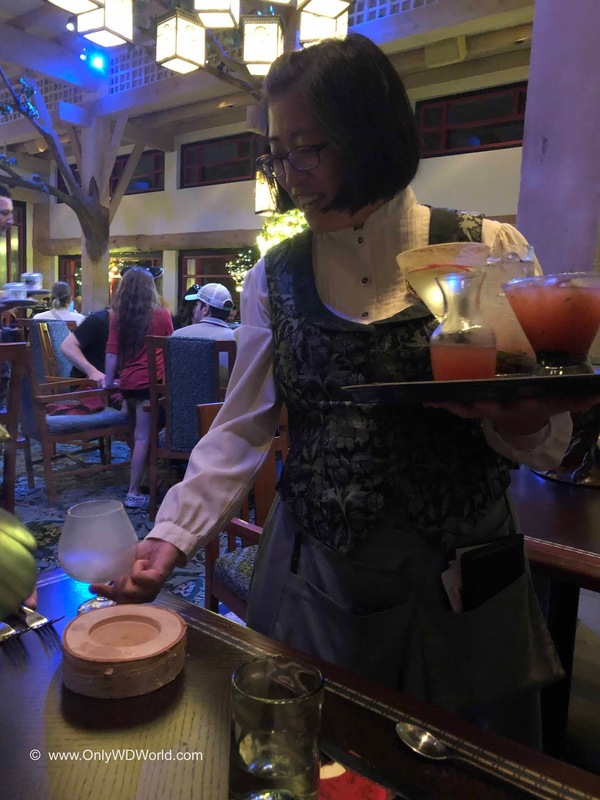 This is a re-imagining of the previous Signature Dining restaurant Artist Point that is located within Disney's Wilderness Lodge Resort. 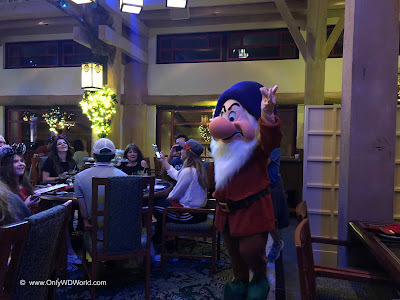 As the name implies the meal is themed around the story of Snow White with a chance to meet Snow White, Dopey, Grumpy, and even the Evil Queen. The best way to report on a restaurant is to go there and experience it for yourself, which is exactly what we did recently to see how this Character Dining experience stacks up again the others that you can find at the Walt Disney World Resort. This newly added meal just started during the month of December and our visit was within the first 3 weeks of operation. During the meal there are 3 forms of character interaction that you will find: Characters coming to your table to meet you, whole restaurant character entertainment, special photo opportunity with specific characters with backdrop. 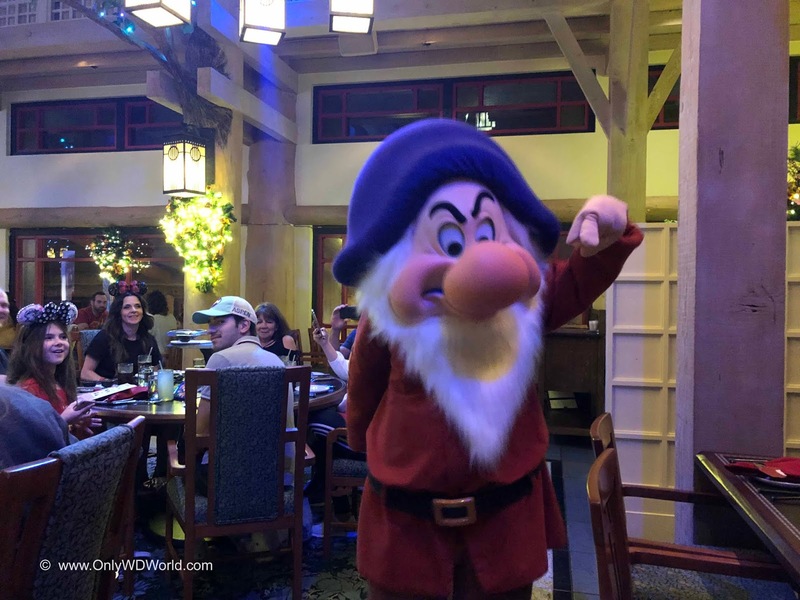 During your meal Snow White, Grumpy, and Dopey will individually come to your table. Snow White was very friendly and carried on a conversation with us. 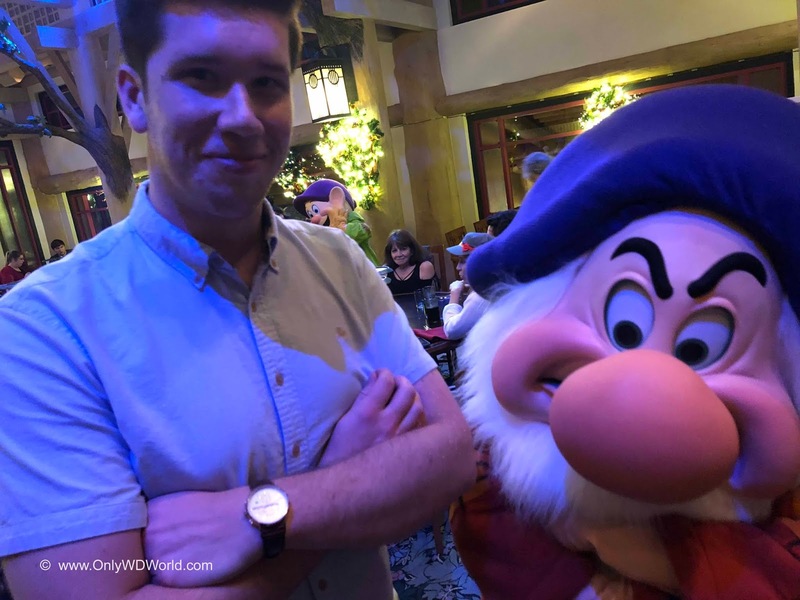 Dopey and Grumpy did not talk,but they were extremely expressive and provided a fun interaction and photo opportunities. If you are a fan then this is a rare opportunity at Disney World and definitely a fun experience. These 3 interactions were the highlight of the meal. Very well done! The broad-based character entertainment involved music and inviting those celebrating a birthday to come dance with the dwarves. 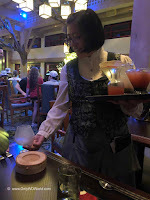 This was fun, but very short and the tables on the perimeter of the restaurant (where we were seated) did not have a good view of the happenings. 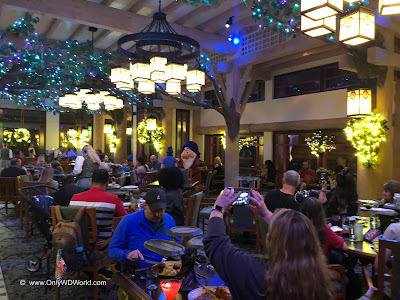 For those of you used to the music during meals at Chef Mickey's this did not impress as much. 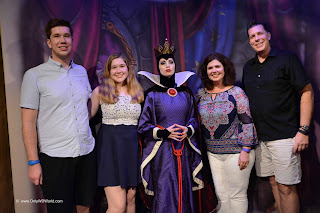 The last character interaction was to meet the Evil Queen and get your picture taken against a special backdrop The queen did talk to each group and stayed true to character during her conversations. This provided a great photo opportunity that is hard to get. The only downside was that the timing for getting your picture with the queen did not appear to be well organized. The make-over to transition from the original Artist Point to the woods that Snow White calls home fortunately was an easy one. 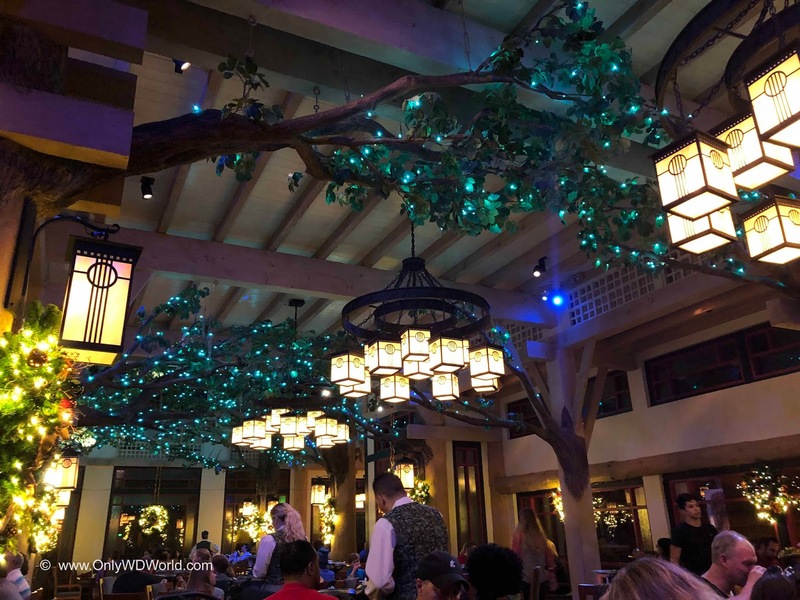 There were additional trees incorporated into the restaurant decor that blended well with the original Arts & Crafts themed decor. Overall a nicely themed area. One of the drawbacks was the table arrangements. The tables at the extreme ends and the perimeter definitely were at a disadvantage compared to the ones in the middle. Having been seated at the extreme end, this did negatively impact the overall experience. The tables have a unique 3 tiered tree serving attachment that made presentation of the different courses easy to display, but it made conversation across the table more difficult. The look is cooler than the actual use during dining. 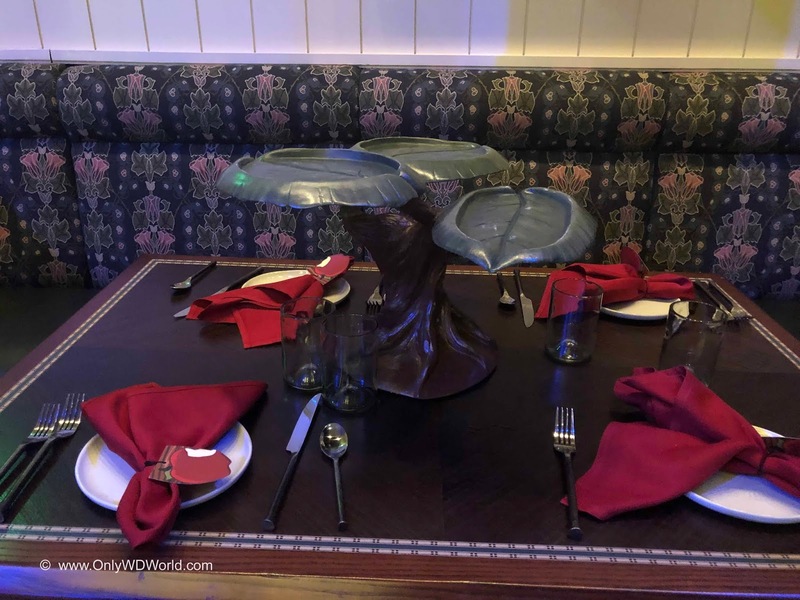 There were also special themed touches during the meal that involved simple special effects such as smoke, but the timing was off somewhat for our server and we never really got to see the full effect of these "touches" as intended. The key to any dining experience is great food. The better the food, the more memorable the dining experience. 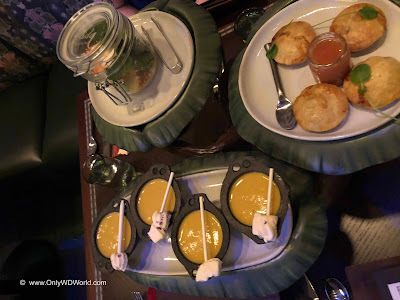 This meal is somewhat unique to other Disney meals. 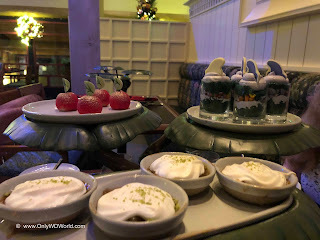 There is a pre-set appetizer selection that is brought to every table, followed by an entree that each individual orders off of a menu, and the meal is completed by another pre-set selection of desserts that is brought to the table to share. This meal is only a 1 Table Service Credit Dining Plan option which includes all of the above plus the addition of one alcoholic beverage for those of age. 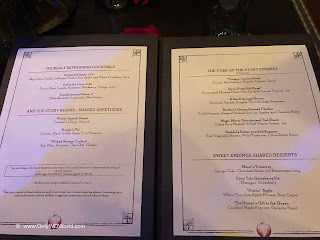 The beverages included a number of specialty cocktails and non-alcoholic concoctions that were created for this Snow White themed meal. Other more traditional wines, beer, soft drinks, milk, and juices were also available to choose from. For our beverages we selected some of the specialty drinks to take full advantage of the theming. Although they were not what we would normally try, it was part of the fun of being at a Disney Character meal. 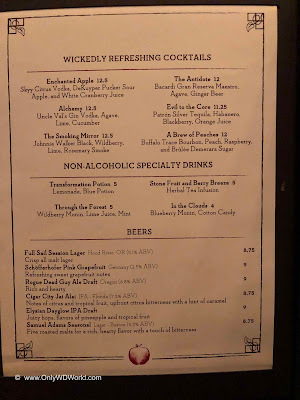 We tried the Enchanted Apple, Evil to the Core, The Smoking Mirror and the non-alcoholic Through The Forest. 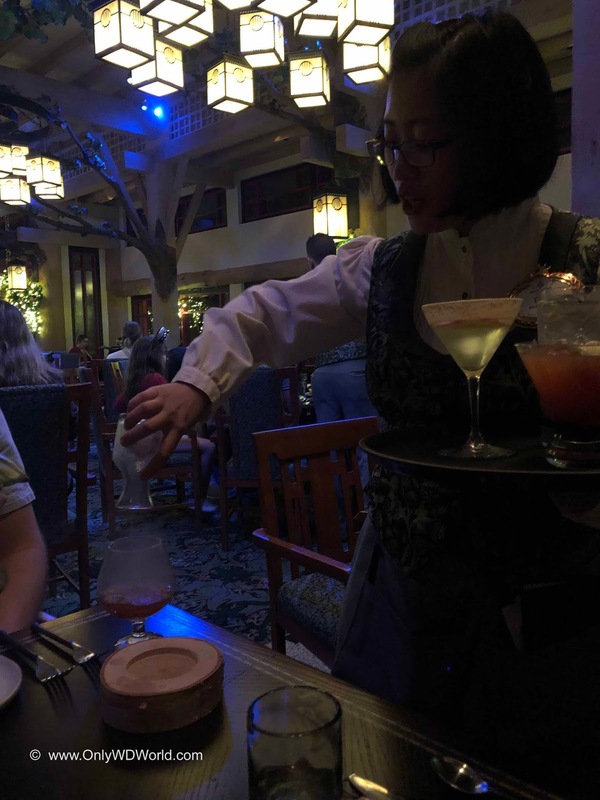 All of the drinks were good, but The Smoking Mirror, which is a presentation drink infused with rosemary smoke at the table, is quite smoky and may not appeal to most. We got it for cool appearance. The trio of appetizers with portions for every include: Hunter’s Pie, Winter Squash Bisque and Wicked Shrimp Cocktail. Of the 3 choices by far the Winter Squash Bisque with Marshmallow stir was the star of the course. It was great, the Hunter's Pie was good and the Shrimp Cocktail was forgettable. 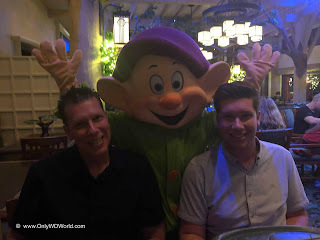 Overall it was a nice beginning to the meal that differentiated it from other Disney Character meals. There were several entrees to choose from that spanned the gamut from beef, to fish to vegetarian. We tried 3 of the entrees in our party to evaluate. 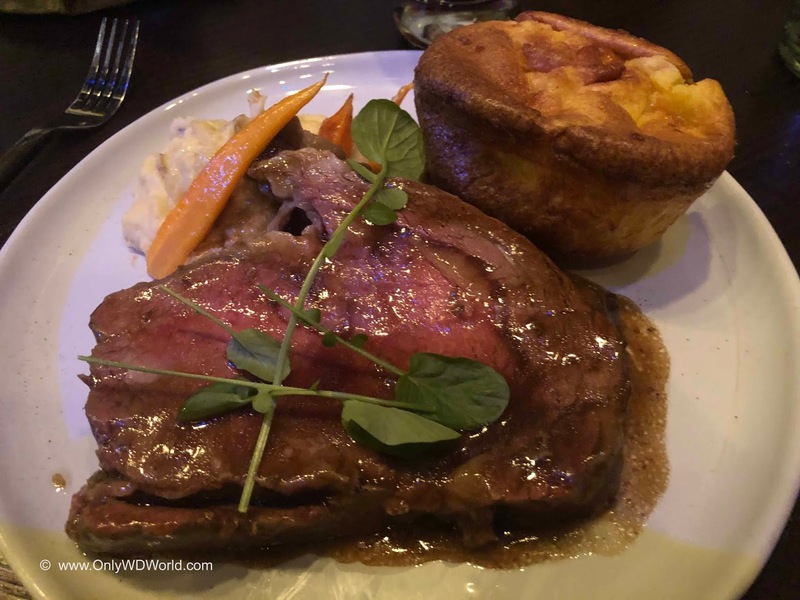 We tried the Prime Rib, the Snapper, and the Veal Shank. 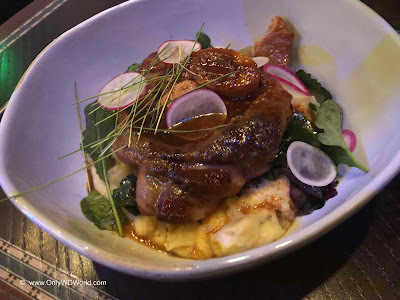 Although they all photographed well we came away somewhat underwhelmed by the flavors. They were all good, not great and certainly not what you would be hoping for coming from a kitchen that was producing Disney Signature Dining meals. For example the Snapper dish featured flavors that were all one noted and nothing really stood out from the dish. The Prime Rib just did not stand out from something that you would get in a local buffet restaurant. 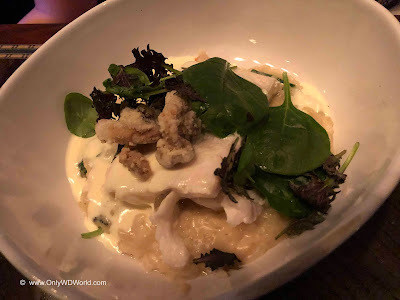 We went into the meal looking forward to the menu descriptions of the entrees and came away feeling that this did not stand up to the standards that we had come to expect from our Disney Dining meals. Of all of the courses, this unfortunately was the most disappointing. From a creativity and presentation standpoint it gets high marks, but the actual desserts were not choices that we enjoyed tasting. There is the “Poison” Apple; Fairy Tale Gooseberry Pie; a sponge cake with chocolate gems and buttercream icing called Miner’s Treasures. 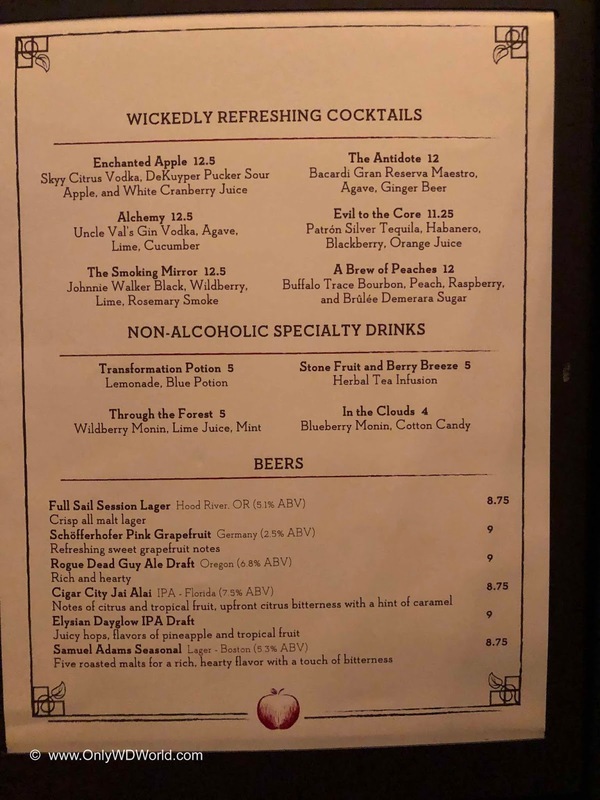 Of the 3 the Poison Apple was our favorite. 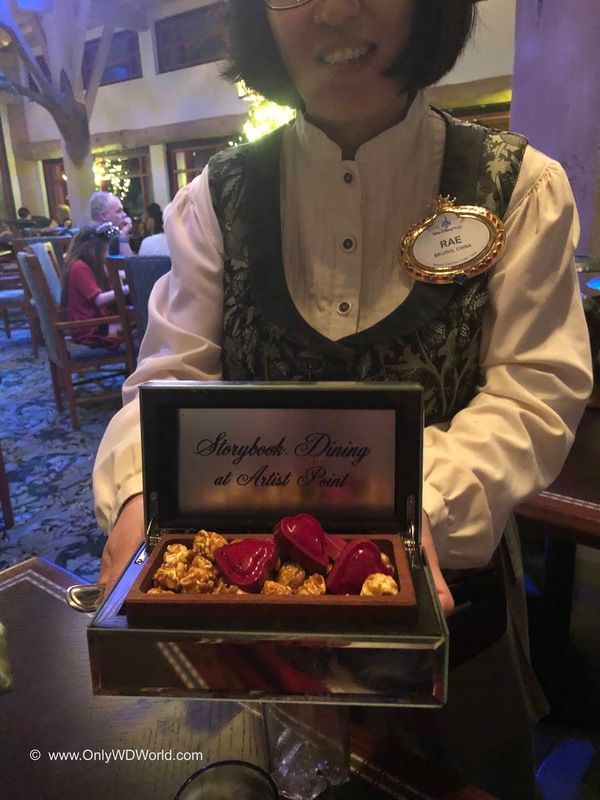 The last part of the dessert is called The Hunter’s Gift to the Queen, which features cracked maple popcorn with a ganache heart. This is another special presentation part of the meal that should have a special smoke releasing reveal, but got lost in the shuffle because our server brought it to the table while we were getting our picture with the Evil Queen. 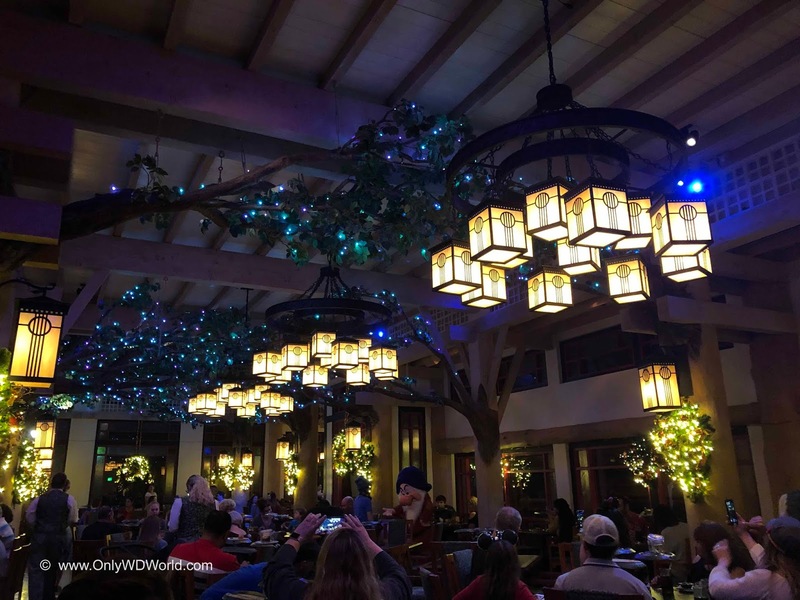 The Storybook Dining At Artist Point with Snow White does provide an excellent reason to visit Disney's Wilderness Lodge Resort which we are always in favor of. The Character interaction was excellent and we really liked the ability to meet and interact with Dopey and Grumpy which rarely happens elsewhere at Disney World. 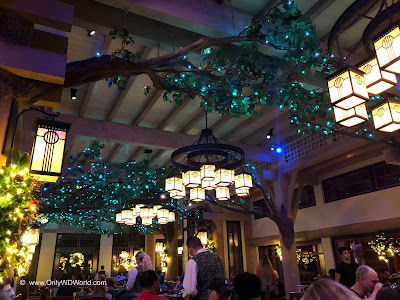 The theming was nice and there was a real attempt to create a cohesive thematic feel to the meal that transports you to the realm of Snow White. 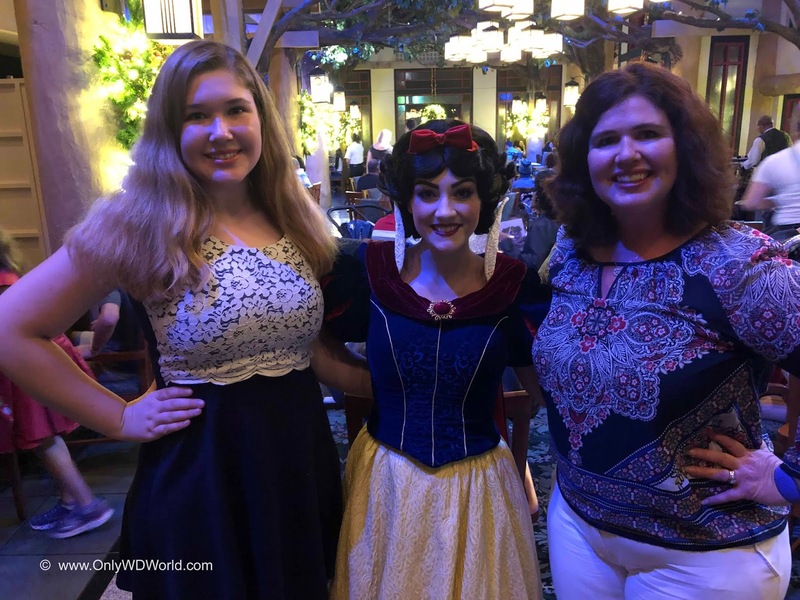 Fans of Snow White and the movie will treasure this special dining experience that allows Snow White to be the star of the show. 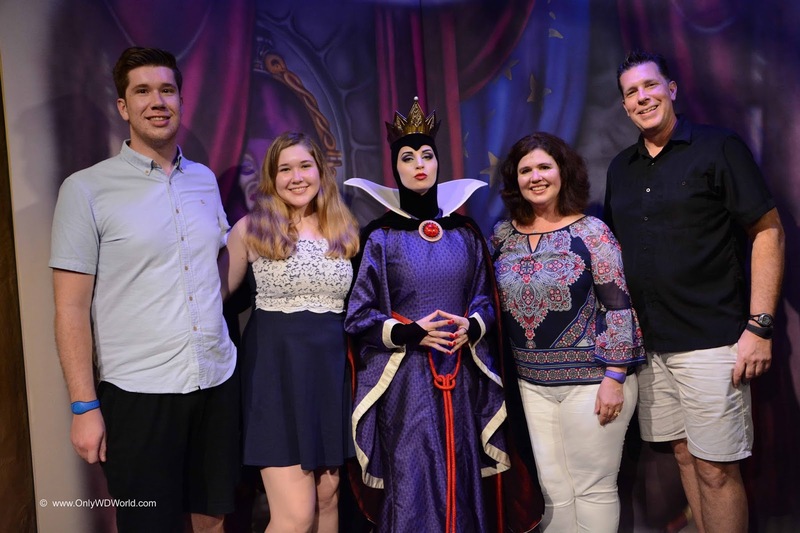 Also Disney Villains fans will also enjoy the chance to interact and get special photos with the Evil Queen. 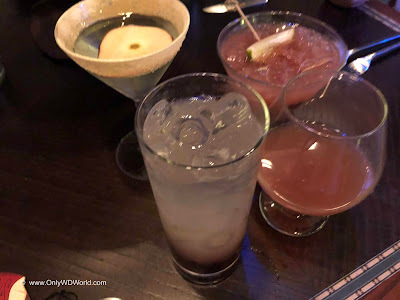 Although a pricey $55 per adult if you are paying cash, it is a great deal if you are using the Disney Dining Plan, which also includes an alcoholic beverage for only 1 Table Service Dining credit. If you are going for the food, this may be a disappointing meal. The food was good, but not great. This was not a memorable foodie meal by any means. All told this is a meal we would recommend trying at least once if you are on the Disney Dining Plan. It is a great value and provides character interactions that you cannot normally get elsewhere. If you are not on the Disney Dining Plan there are certainly many other place at Disney World where you can get better food for the money. 0 comments to "Review: Storybook Dining at Artist Point with Snow White"